The corrupt mayor of New York City has been a thorn in Harley's side since the day he stepped into office�and now he's crossed the line one time too many! Harley's usual methods of dealing with problems like this have failed her, so it's time for a more unconventional solution�is New York City ready for Mayor Harley Quinn? It better be! 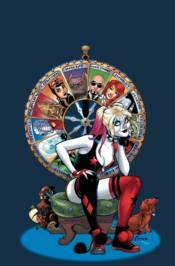 Don't miss these stories from HARLEY QUINN #28-34.